It comes in a soft tube with a snap-on lid. The opening is well-sealed with a foil, so remember to peel it off before use. Wet your face. Squeeze an appropriate amount (pea-sized) of cleanser onto your palm and lather it up. Massage it onto your face in small circular motion — moving from the center of your face outwards. Then rinse it off thoroughly with lukewarm water. I have been using this cleanser for about a month now. So far I super duper mega love it! HOLY GRAIL ALERT! It has a moist, creamy texture and a refreshing herbal scent. It can be easily lather up and rinse off. Y'know, acne products usually tend to be drying on the skin, but this doesn't overly dry up my skin which is a plus! It cleanses and refreshes my skin, while preventing the occurrence of pimples without aggravating the existing zits. I find this is less drying compared to the former version, AC Clinic Daily Acne Foam Cleanser. 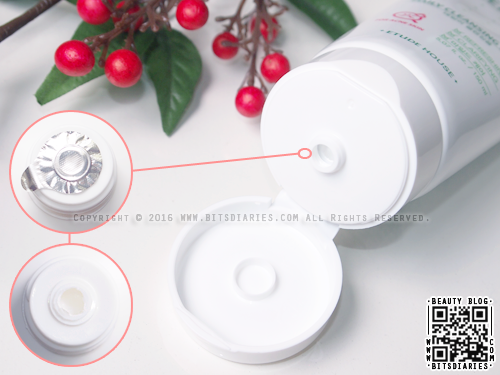 It is certainly gentle enough for both day and night use and is suitable for sensitive skin. Overall, this is a great facial cleanser for acne-prone skin. I highly recommend it to all! On a side note, many people often neglect the importance of using the right facial cleanser. Remember, the best cleanser for your skin should do the cleansing job without making your skin feel tight and dry. Also, you may want to avoid cleanser with sodium laureth sulface (SLS), which is a kind of foaming agent that strips skin of its moisture and aggravates sensitive skin. Therefore, you may want to read the labels before making your purchase. In the upcoming weeks, I will be sharing my thoughts on the rest of the AC Clean Up skin care products except for the Acne Patch and Sheet Mask. If you are interested, keep an eye out on this blog. Have a great weekend, guys! which one do you think is better? this one or the old ac clinic acne foam cleanser?